The Great Basin Collared Lizard has a large head and brown to grayish-brown body with many white spots and dashes along their back. 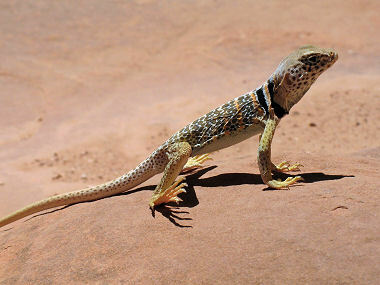 The black strips around the neck easily identify it as a collared lizard. The Sonoran Collared Lizard can be found in the Great Basin, Mohave and Sonoran deserts in rocky areas such as, slopes, gullies, washes, canyons, and sometimes rock piles, although occasionally can be found up to a mile from extensive rocky habitat. It is most common in desert succulent shrub, desert scrub, and desert wash habitats and can often be found basking on large boulders during the day throughout the warmer months of the year. 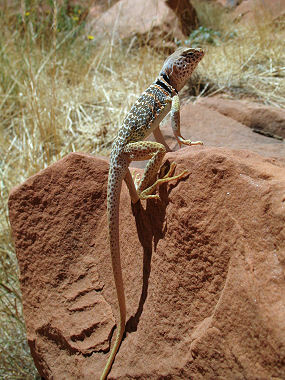 Male Great Basin Collared Lizards behave aggressively toward each other but will tolerate subordinate males. The diet of this species consists largely of insects, but it will also eat other lizards such as whiptails. The Sonoran Collared Lizard mates between May - June and females lay 3-8 eggs in midsummer.